Jumbo baked potatoes are simple to prepare and make a suitable accompaniment for roast beef, chicken or pork, or can stand on their own as a quick meal with a few added toppings. Sweet potatoes and white potatoes are good-for-you foods that are low-calorie, low-fat and rich in vitamin C and potassium. One 5-oz. white potato contains a mere 110 calories, while a 4-oz. sweet potato contains 105. If you are pre-diabetic or diabetic, or are simply concerned about your blood sugar levels, stick with sweet potatoes. White potatoes, particularly when baked, have a high glycemic index rating, meaning that your body absorbs the carbohydrates in them quickly, making your blood sugar levels spike very high. Rinse the potato under cold, running water, and scrub it thoroughly with a stiff brush to ensure that you remove all of the dirt. Pat the potato dry with paper towels. Prick the potato sharply about 10 times with the tines of a fork to make deep punctures. Coat the potato with olive oil and season thoroughly with kosher or sea salt on all sides. Place the potato on a baking sheet and cook it in the preheated oven for roughly 1 hour. Test the potato to see if it is thoroughly cooked. The flesh should be soft and the skin should feel crisp when you squeeze it. If the potato is not thoroughly cooked, give it another 10 to 15 minutes in the oven. Make twice-baked potatoes by scooping out the flesh of the potato and mixing it with some butter, cream and seasonings. Stuff it back into the potato skin and bake until golden brown on top. Sprinkle some chopped chives, bacon crumbles or shredded cheese. 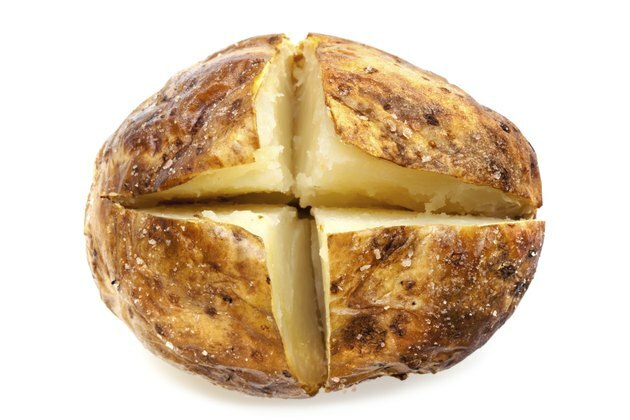 Celebrity chefs Patrick and Gina Neely use sour cream, cheddar and Gouda cheese in their twice-baked potatoes, while Giada De Laurentiis stuffs hers with garlic, oregano, cheddar, prosciutto and mushrooms. Although you may be tempted to wrap your potato in aluminum foil to speed up the baking process, don’t do it. The foil actually makes the potato steam instead of bake so that you wind up with a soggy skin and different texture in the potato.